Treat yourself to down-home cooking featuring favorite Middle-American and Chinese comfort foods. Dine indoors or in the charming enclosed patio on beloved dishes made with a very special element — Coca-Cola®. Check out the picturesque Victorian décor that includes a collection of vintage Coca-Cola® memorabilia. 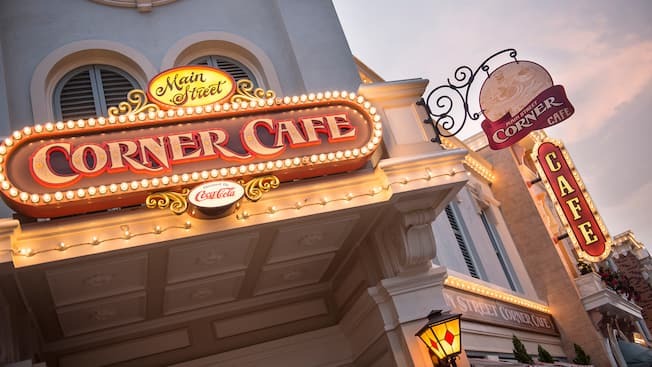 Open for lunch and dinner, Main Street Corner Cafe features a tasty menu that includes sandwiches, American entrees, Italian pastas, salads, soups and Western desserts. The restaurant has good times cornered with perennially pleasing options like Cobb salad, tomato soup, cream of wild mushroom latte, wagyu beef burger, New York Reuben sandwich, baby back pork ribs, roasted chicken, vegetable lasagna and pesto penne with meat balls. Main Street Corner Cafe offers 2 great special set menus that allow you to savor the full dining experience: the Western special set menu and the Flavors of Asia set menu. The fun and delicious kids menu includes Disney character pasta, Mickey’s chicken tenders, Daisy’s rice omelet, Goofy’s fish fillet and Donald’s beef burger steak with tomato rice. Cool down with refreshing specialty drinks, such as Coca-Cola® floats, pink grapefruit soda, Sulley’s Blue Frightener or the signature Corner Cafe Popcorn Carnival made with creamy vanilla ice cream and crispy popcorn. Enjoy afternoon tea with savory food and sweet dessert set menu. Kick back, relax and take in the amazing view of happy people walking down Main Street, U.S.A. Feeling like a bite to eat? The Magical Afternoon Tea Set includes sharable, snack-sized portions that are perfect for 2 people. If you’re in the mood for dessert, try the Afternoon Dessert Set, which will tickle your sweet tooth with cake, tropical fruit and premium ice cream. For questions or to make reservations, please call +852 3550-3388. Advance reservations are strongly recommended and can be made up to 42 days prior to your visit—or 120 days prior to your arrival date if you are staying at either Hong Kong Disneyland Hotel or Disney’s Hollywood Hotel.